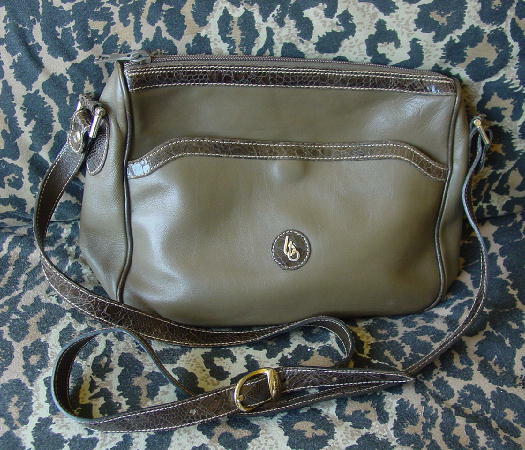 This vintage genuine leather taupe-khaki with a touch of olive (color is not as olive as it appears in the pictures) purse was made in Italy by Bettina. The synthetic (feels like a thick plastic) black lining has bettina in cocoa color letters on the lining. The front compartment has a magnetic snap closure, and the Bettina logo in gold-tone letters on an embossed brown reptile circle. The back has blue ink spots on it. 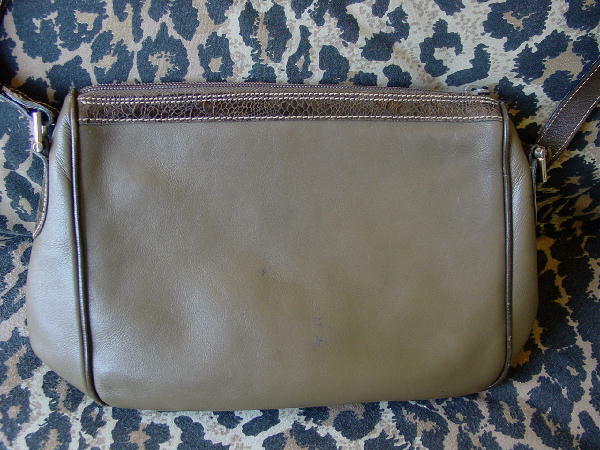 There is a top side to side zipper and brown faux reptile accent edging. It has a 50" long by 5/8" shoulder strap which is embossed on one side and plain leather on the other side. The lining has some scuff marks.